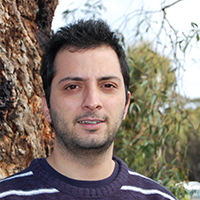 Shirish commenced his PhD with CeRDI in 2016 with Data61 as the industry partner. His research brings together geospatial data from involuntary sources such as social networks into web-based geoportals. The supervisory team for Shirish's PhD is Assoc Prof Peter Dahlhaus, Dr Angela Murphy and Dr Iman Avazpour. Research in data integration is gaining momentum as a result of rapidly advancing technologies. Involuntary data generated by citizens holds great potential in enriching information from authoritative data sources.